The other weekend my daughter had a sleepover, and I needed to redeem myself with breakfast, since the dinner I’d served the night before was…well…absolutely horrible. It was leftover Chinese food. Unthinkable, right? So, the kids asked for pancakes, and I said yes before I realized I was out of my usual organic mix. And parents were coming to pick their kids up in about 25 minutes. Crap! I pulled out The Joy of Cooking and made pancakes from scratch, and it reminded me just how easy they really are…no mix necessary! I have since adapted the recipe slightly (I prefer even numbers) and so, here it is. The whole thing, from beginning to end (end being in the tummy), takes about 30 minutes or less. 1. Throw everything into a bowl, and whisk! 2. Melt butter in a giant cast-iron skillet, or wherever you cook your pancakes. 3. Use a ladle to drop in some pancake batter, and cook, turning over when the pancake is bubbly and golden. 5. Serve with REAL organic maple syrup! Yum. Pancakes go very well with bacon. This recipe serves four fully, and six if bacon is involved. I also love to occasionally have pancakes with jam for afternoon tea! It brings back memories from a sailboat excursion in the British Virgin Islands a very long time ago. Sigh! Substitute buttermilk for milk. Substitute some cornmeal for some of the wheat flour. Add a little vanilla for flavor. They need some melted butter added to batter too. Why wait for “in a pinch” to make pancakes. We make them 3 or 4 times a week. Nothing takes the place of well made, home made pancakes with organic pure maple syrup. Fruit syrups are also great. Don’t forget a nice pat of butter for the top! Mangia! I started using this recipe from “100 Foods That Could Save Your Life” a couple years ago. We love it! I mix the oats and buttermilk the night before and put it in the ice box. Then the next morning throw in the rest of the ingredients and presto! The kids love them. Especially with homemade berry syrup. Yes but who has buttermilk sitting around? ANd I’ve never seen organic buttermilk! I make my own mix using a recipe from King Arthur Flour. I think it is on their website. I vary the flours sometimes using other than white and whole wheat. Because I use whole grain flours which I keep in my freezer, I store the mix in recipe portion freezer bags or containers in the freezer as well. I’ve also added whole egg powder and pure vanilla powder to the mix. All I need to do is dump the mix in a bowl and add water or milk and the pancakes are ready to go before the griddle is even heated up. Homemade from scratch in a few minutes with almost no clean-up. Try substituting milk with vinalla almond drink. Very good! my son’s friends love my pancakes….Aunt Jemima from a box but what really gives it a great flavor is very simple……………..vanilla extract! Plan on making this recipe but I have to add the vanilla extract – you may want to try it yourself! Nothing beats buttermilk in a pancake recipe-and I never add sugar-never needed, in my opinion. No buttermilk? Add one tablespoon vinegar or lemon juice to milk and let stand a few minutes. One cup flour (I add oatmeal to it), 1 tsp baking powder, 1/2 tsp baking soda, 1/2 tsp salt in one bowl, 1 cup buttermilk, 2 T olive oil and 2 eggs in another bowl. Whisk dry and then whisk wet and then combine them gently. A sizzling and lightly oiled pan-temp is key! I buy buttermilk and freeze it because I never know when I will be in the mood to make a cake or anything else that requires it. I’ve never seen organic buttermilk either. Boy, this conversation is making me hungry! My mama was from Alabama, my daddy from Tennessee – I’ve got buttermilk in my veins – it’s ALWAYS in my fridge! It’s a beverage as well as an UNBEATABLE ingredient in so many cooked things. Besides pancakes, biscuits, and cornbread, Southern-fried chicken and gravy at my house means buttermilk in both the chicken AND the gravy. Buttermilk is as much a staple in my house as cornmeal – I’m NEVER without either one. I’ve done the vinegar/lemon juice-in-milk substitution in a pinch, but it’s NOT the same… I prefer substituting yogurt or sour cream, if I have them. I make DOZENS of different kinds of pancakes – mixing different grain flours, adding different whole grains and brans (some need to be soaked in the buttermilk or cooked ahead of time), different sweeteners, adding different chopped fruits (fresh & dried), adding sausage or bacon (cooked first), adding cheese, adding vegetables… I make pancakes stove-top on a griddle, also in the oven – and cooking them over a campfire in an iron skillet that’s had bacon cooked in it is SUBLIME! Sorry to go on and on and on – I’ll spare you descriptions of all the toppings I make (personally, my favorite is no topping, just a small amount of butter). I’m going to go make some pancakes right now! Way to go, Maria. I like to think outside the mix too!! The BEST ever pancakes–in the mountains over campfire, with kids n grandkids around, bacon grease in the iron skillet, eggs, REAL butter–hand made at home to take, ashes flying, coals red hot, wood smoke in the early morning Rockies air–OMG how I want warmer weather so we can go camping (and cooking)!!! I tried the pancakes and loved them. I found organic buttermilk at wholefoods. I was glad to find out that I could freeze buttermilk,what a good tip. I was looking on line for pancake recipes from scratch,and I found this web site .So now I’m gonna try the pancake recipe that I have been looking for. I’ll be back for other recipes .I like to bake everything from scratch,not from a box.I have some of my mother’s recipes,not all everything she baked was from scratch.Thanks Maria’s farm country kitchen. I love this all about foods from scratch. I’m 74 so i’ve done alot of it, especially with 6 kids, 15 g-kids, and 18 gg-kids. I found a quick cooking method for bisquits, cake, pancakes and sandwiches. I bought one of those sandwich makers just to make quick ones for the kids, but I found out you can use it to make quick cakes, pancakes and so forth. Just make your batter and cook it on this thing. So quick (no oven or stove to heat up.) Slice open the cornbread ones, dollop of butter, YUM. Slice open up a cake one plop ice cream on it. YUMMY We even eat them plain. Pancake ones good with syrup or fresh fruits. Try it you’ll like its easy-ness. Hi Ellie,I well come all questions rearidgng baking. I will try my best to help. :)Using damp cloth to cover proofing dough is to keep the dough moist so that it will rise nicely. If the dough starts to form a dry surface tie will not rice much as the dry crust will give some resistance to the dough as it try to stretch and ‘ grow’ .i usually use cling film just wrap around the rim of the proofing bowl and let the dough rise. It is perfectly fine to open the towel to check on the dough to see how the dough is doing. In the event the dough is overproofed, you may wanna use it as pizza dough instead of making it as loaf, as your bread will not be soft and ligh, as the same time it will not rise very high as a bread loaf should be, on top of that it will turn smelly like beer taste. Hope My explanations are clear and helpful. Served these over the weekend for my nieces and nephew – they were a huge hit! Thanks for sharing. I second the use of real organic maple syrup – we grew up with the commercial Mrs. Butterworth-type stuff and the real stuff is so much more amazing. (And also not loaded with a bunch of crap.) Have you ever made fruit syrup? I saw Nigella Lawson make blueberry syrup once – organic maple syrup and blueberries. Put them into a pot, bring them to a boil, let ’em bubble for a few minutes, then serve warm. 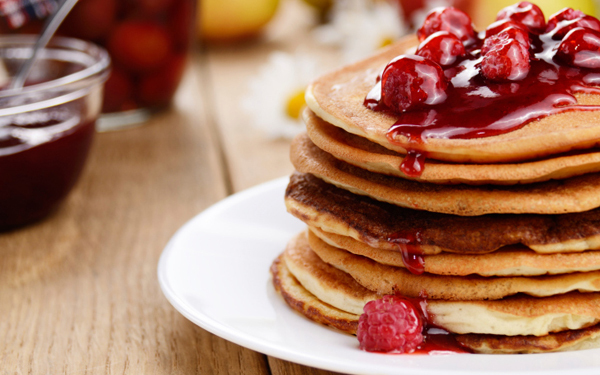 Wonderful complement to your pancakes! My kids made waffles from this recipe-so simple and yummy! I wasn’t sure what to substitute to add oil in for the crisp waffle taste so we used 1 1/4 cup of milk and 1/3 cup of oil instead- perfection!!! They were very proud kiddos! These were actually good enough didn’t need much syrup. (One kid used peanut butter and one used berries) Definitely an easy recipe-thank you!